What is Alcey Magic keypad？It's a cool extra accessory accompanies with your Apple Wireless Keyboard, creating the sleek, additional numeric input device you've been imagining. The integrated ergonomic tilt provides added comfort which helps reduce wrist strain after a long work day. The commentary rechargeable Micro USB cable to provide additional flexibility in the work-space when it is no power. Ergonomic design, comfortable typing and durable keys of 5000000 times pressing give you a wonderful working environment. Support 145 hours continuous use if getting fully charged. And will last longer if in not frequent-use status. Based on two hours of non-stop use per day, it can be used for about 72 days. Support Windows 7/ 8/10 above, Mac OS 10.0 above, IOS 9.2 and above. Simply press any key to wake it up. The LED indicator shines in red during the recharging. It stops shinning when thebattery is fully recharged.Please recharge the device when the LED indicator flashes in red. In Windows OS, the keys of "clear" functions as "Num Lock". "NumLock" is closed in the default setting. Press the key of "clear" to open the "NumLock". The keys of 0, 1, 2, 3, 4, 6, 7, 8, 9 and "." can be written directly in your computer. 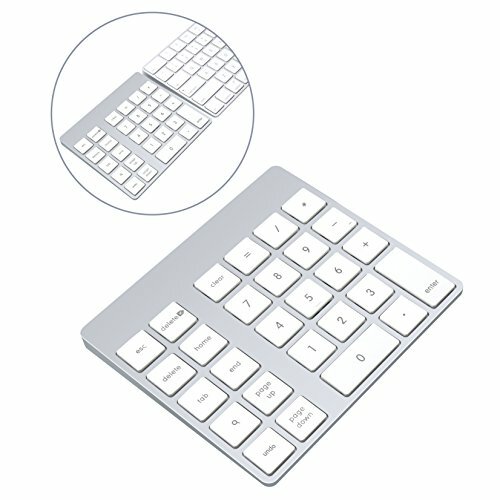 Ergonomic tilt design and made of aluminum excellent material, greatly fits the Apple wireless keyboard; Certified with CE, ROHS & PAH to ensure the high-quality of this magic keypad. Using the advanced Bluetooth 3.0 chip provides a lightning fast connection with your iMac; Red LED lights indicate charging status and also comes with a Micro USB cable. Build-in 3 month rechargeable lithium batteries with 260mAH between charges( based on non-stop 2 hours per day); Auto sleeping function to save power, back-lit On/Off control. It turns its self off when not in use. Broad Compatibility with Windows 7/ 8/10 above, Mac OS 10.0 above, IOS 9.2 and above.